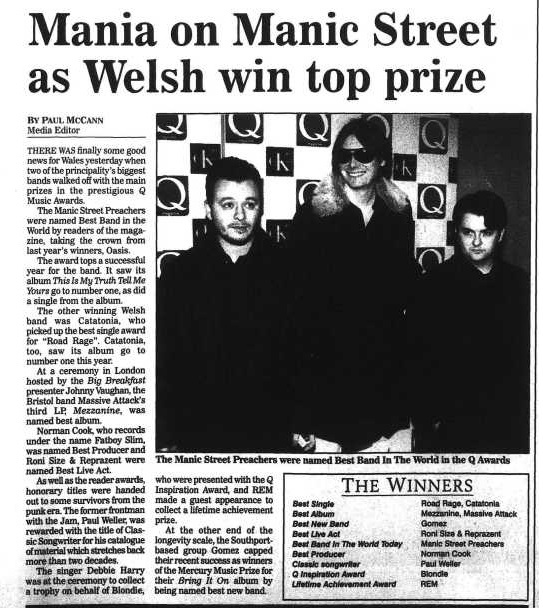 There was finally some good news for Wales yesterday when two of the principality's biggest bands walked off with the main prizes at the prestigious Q Music Awards. The Manic Street Preachers were named Best Band in the World by readers of the magazine, taking the crown from last year's winners, Oasis. The award tops a successful year for the band. It saw its album This Is My Truth Tell Me Yours go number one, as did a single from the album. The other winning Welsh band was Catatonia, who picked up the best single award for "Road Rage". Catatonia, too, saw its album go to number one this year. At a ceremony in London hosted by the Big Breakfast presenter Johnny Vaughan, the Bristol band Massive Attack's third LP, Mezzanine, was named best album. Norman Cook, who records under the name Fatboy Slim, was named Best Producer and Roni Size & Reprazent were named Best Live Act. As well as the reader awards, honorary titles were handed out to some survivors from the punk era. The former frontman with the Jam, Paul Weller, was rewarded with the title of Classic Songwriter for his catalogue of material which stretches back more than two decades. The singer Debbie Harry was at the ceremony to collect a trophy on behalf of Blondie, who were presented with the Q Inspiration Award and REM made a guest appearance to collect a lifetime achievement prize. At the other end of the longevity scale, the Southport-based group Gomez capped their recent success as winners of the Mercury Music Prize for their Bring It On album by being named best band. This page was last modified on 22 May 2018, at 08:18.